A US president excoriating the leader of a fellow NATO member country while singing the praises of a totalitarian leader who has threatened nuclear strikes against US territory and several American allies left analysts reeling, but it underscored Trump’s essential disregard of the conventional foreign policy playbook. As a long-standing US ally, Australia takes a keen interest in the Trump administration’s conduct towards traditional allies and foes alike. If Canberra felt nervous about Trump’s conduct earlier this month, the Turnbull government gave nothing away. Applauding Trump’s “visionary leadership” in meeting with Kim Jong-un, Prime Minister Malcolm Turnbull did not engage with the president’s public condemnation of a counterpart Five-Eyes member.4 Although some Australian officials are privately anxious about the Trump administration’s cavalier approach to alliance management generally, they believe Australia can weather the storm because of its strong institutional connections with the United States. There is no evidence—at least none yet—that Australia’s relations with the United States are deteriorating or that it is hedging against the alliance. A former senior adviser to Turnbull has recently noted that, “Under the uncompromising leadership of Xi Jinping, China’s activities have become so brazen and so aggressive that we can’t ignore it any longer.”7 These comments have been accompanied by a growing appreciation of China’s unprecedented reach and influence in Australia. For some time, China has loomed large in Australian politics and society by virtue of the rapidly expanding economic and people-to-people relationship between the two countries and the dependence of key sectors of Australia’s economy (including mining, tourism, and higher education) on the Chinese market. What is new in the current Australian discourse is a growing mainstream view that the CPC is seeking to exert unprecedented influence to achieve instrumental political outcomes, the overriding one being compliance with China’s worldview. For its part, Beijing has expressed irritation with what it characterizes as “anti-China alarmism” in Australia and has implicitly sought to link rising concern with CPC activities in Australia to the country’s racist past.8 Following a recent meeting with Foreign Minister Julie Bishop, Foreign Minister Wang Yi argued that Australian policymakers must adapt their “traditional thinking to take a more proactive approach towards the relationship.”9 In a sign that Chinese officials are retaliating, Australian exporters have faced unusual delays in gaining regulatory approvals in China while Australian universities have been on the receiving end of thinly-veiled threats that Beijing will warn its citizens against studying in Australia on the grounds of “safety” concerns.10 The significance of these actions, and of Beijing’s increasingly dark rhetoric, has been magnified by the manifest dependence of Australia’s economic prosperity on continuing access to Chinese markets. It is a virtual mantra among Australians that their country’s economic future is inextricably linked to China. Publicly criticizing China is not without risk for Australia. As John Garnaut observes, “nobody knows what happens when a mid-sized, open, multicultural nation stands its ground against a rising authoritarian power that accounts for one in three of its export dollars.”13 Indeed, the scope for “payback” from Beijing is recognized by Australian policymakers who have emphasized that economic and people-to-people ties should be compartmentalized from the political swings and roundabouts in the bilateral relationship. Given China’s recent track record of economically targeting regional states that openly defy Beijing on major political and strategic matters, one has to wonder about the realism underlying Australia’s “bracketing” of discrete areas of the relationship. South Korea’s recent experience in having key sectors of its economy targeted by Beijing in retaliation for approving the deployment of a US missile defense system on its sovereign territory should serve as a warning to Australian policymakers on the practical limits of any bracketing strategy.14 A key question—perhaps the key question—is whether senior Australian policymakers are willing to seriously risk bilateral economic relations with China by continuing to publicly criticize Beijing’s political and strategic conduct. The other position is that Australia is best served in the long run by resisting China’s attempts to expand its strategic footprint, including through ambitious territorial claims in Asia. From this perspective, the alliance with the United States and an active American presence in the Asia-Pacific provide an important counterweight to Beijing’s preference for exerting pressure against countries that do not share its worldview. More specifically, Australia must avoid bandwagoning with China—or giving the impression it is bandwagoning—at the same time reinforcing coalitions with like-minded regional states including Japan and India (either within or outside a formal quadrilateral arrangement with the United States). This position endorses the view that Australia must strive to retain complete autonomy in determining its policy preferences on major issues independent from Chinese pressure. For those in this camp, evidence of Chinese attempts to influence domestic affairs in Australia merely reinforces the importance of asserting autonomy in strategic policy. However, these lines of debate obscure a more complicated picture for Australian policymakers. Australia has on several occasions accommodated China in the sense that it has acceded to Beijing’s policy preferences when, all things being equal, Australia would have maintained its existing position. Confronting robust criticism from Beijing, in 2008 the Rudd government terminated Australia’s involvement in the Quadrilateral Security Dialogue with the United States, Japan, and India.16 And in 2013, Australia’s Defence White Paper (DWP) conspicuously omitted any reference to the lack of transparency in China’s military modernization that had appeared in the 2009 DWP; which had provoked shrill public condemnation from Beijing.17 While the contemporary spotlight remains fixed on tough rhetoric from Canberra in relation to China, the reality is that Australia pursues a strategy of hedging in its relations with China. Although Australia has exhibited a growing willingness to challenge Beijing publicly, this needs to be understood in the broader context of Australia’s established policy of hedging against China’s rise. Employing Evelyn Goh’s formulation, hedging can be defined as “a set of strategies aimed at avoiding (or planning for contingencies in) a situation in which states cannot decide upon more straightforward alternatives such as balancing, bandwagoning or neutrality.”20 The classic theoretical dichotomy between balancing and bandwagoning is too narrow to accurately describe the response of many states in the Asia-Pacific to China’s rise, and Australia’s response is no exception. The optimal contemporary test case for Australia’s hedging strategy is its response to China’s Belt and Road Initiative (BRI). A mega-project designed to drive greater trade and investment connectivity between China and the rest of the world, the BRI has as its centrepiece an unprecedented series of massive infrastructure projects to build “an economic corridor including about 65 countries and areas along the ancient Silk Road or the Belt and Road lines.”21 While the ostensible focus of the BRI is economic, it is clear that Beijing sees it as fulfilling a major geopolitical purpose by deepening China’s strategic influence.22 With the advent of the Trump administration and its inward looking “America First” strategy, the BRI, which envisages a globally engaged China, appears to be exquisitely timed. Reactions to the BRI have, predictably, tended to mirror existing views about the merits or otherwise of China’s rise, its increasingly muscular economic influence, and perceptions of Beijing’s expanding presence internationally. Some European countries, including Germany, have expressed concern that the BRI will further promote China’s global influence and pose a potential threat to liberal democracy because of Chinese authoritarian practices.23 In Asia, while Malaysia, Thailand, and Sri Lanka have been prominent in endorsing the BRI, India, Vietnam, and Japan (despite recent ambiguity) have expressed reservations and linked the initiative with what they portray as a geopolitical threat from China. In the middle, a significant minority of countries, although publicly welcoming the BRI as a positive measure, are nevertheless reluctant to become directly involved in helping Beijing operationalize its vision. Australia is part of this group. The Turnbull government’s endorsement of bilateral consultations with Beijing over how Australian companies can slot into Chinese-funded infrastructure projects in third countries undermines the claim that Australia has either rejected or ignored the BRI. At the same time, Canberra’s evident discomfort at being locked into the BRI through the Northern Australia Infrastructure Facility mirrors a classic hedging approach. Notwithstanding the Labor Opposition’s decision to remain “open-minded” about the BRI, it too has stopped short of committing unreservedly to China’s vision.29 Unsurprisingly, positions staked out in Australia regarding the merits or otherwise of the BRI strongly reflect broader positions on how Australia should be engaging China. The hedging posture adopted by policy elites towards the BRI and engagement with China generally is not simply the result of competing perspectives within government and civil society over how best to manage relations with Beijing; it is a deliberate strategy aimed at avoiding the stark choices associated with bandwagoning and balancing. The extent to which this strategy remains viable will of course be contingent on the type of pressure Beijing may bring to bear on Australia’s interests, but this is not the only variable. Much will come down to whether Australian policy elites are willing to bear the potential economic costs of challenging China on political and strategic issues. Building informal coalitions with like-minded countries that are similarly pursuing hedging strategies towards China, reinforcing multi- and mini-lateral security architecture in Asia, and strengthening the security alliance with the United States will be important ingredients in reassuring Australian policymakers that a hedging strategy towards China is sustainable. Key here will be avoiding a situation where Australia is regarded by the Trump administration as an encumbrance, in which case Canberra will have to make some serious decisions about larger-scale investment in military capabilities to hedge against the declining credibility of US extended deterrence. 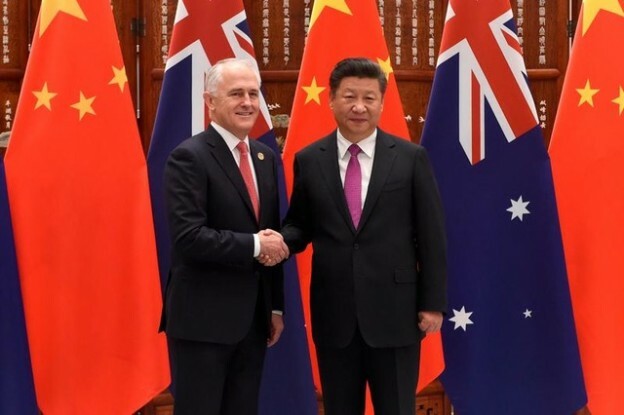 However, irrespective of the US alliance, it is clearly time for serious conversation in Australia about the dubious assumption on the part of policy elites that Australia can necessarily compartmentalize its highly successful economic relationship with China from fallout in the edgier political and strategic domains. Beijing’s increasingly direct approach in dealing with what it sees as dissent in the Asia-Pacific fundamentally challenges the view that small and middle powers can have their cake and eat it too when it comes to relations with China. 15. See Hugh White, The China Choice: Why We Should Share Power (Oxford: Oxford University Press, 2013). 20. Evelyn Goh, Meeting the China Challenge: The US in Southeast Asian Regional Security Strategies, (Washington DC: East-West Center Policy Studies, No. 16, 2005), p. viii. 21. Yong Wang, “Offensive or Defensive: The Belt and Road Initiative and China’s New Grand Strategy,” The Pacific Review 29, no. 3 (2016), p. 456. 22. The implementation of BRI—as distinct from its vision—remains somewhat fragmented. This seems “contrary to common perceptions of calculated strategic direction,” as noted in Shahar Hameiri and Lee Jones, “China Challenges Global Governance? Chinese International Development Finance and the AIIB,” International Affairs 94, no. 3 (2018), p. 586. 25. James Laurenceson, Simone van Nieuwenhuizen, and Elena Collinson, “Decision Time: Australia’s Engagement with China’s Belt and Road Initiative,” Australia-China Relations Institute Report, UTS, November 2017, p. 3.